Removal ProcedureRemove the drive belt. Refer toDrive Belt Replacement.Remove the oil level indicator tube. Refer toOil Level Indicator Tube Replacement.Raise and support the vehicle. Refer toLifting and Jacking the Vehicle. 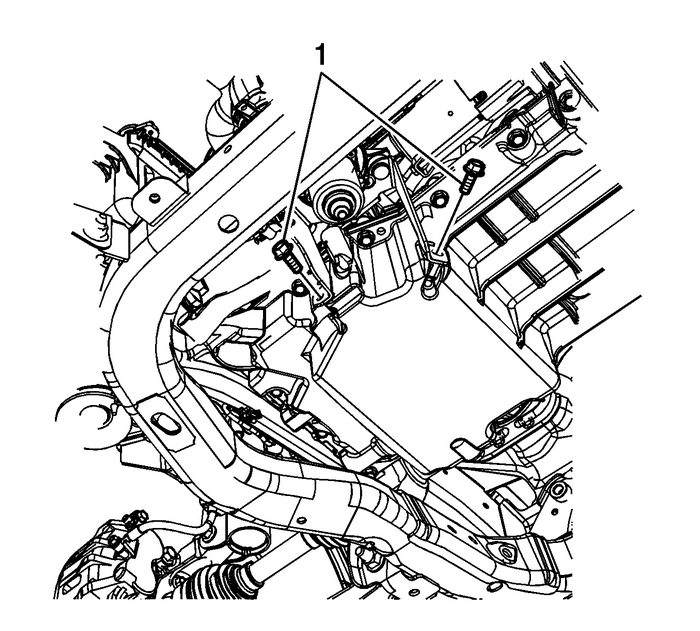 Loosen the upper air conditioning (A/C) compressorbolts.Remove the lower A/C compressor bolt. 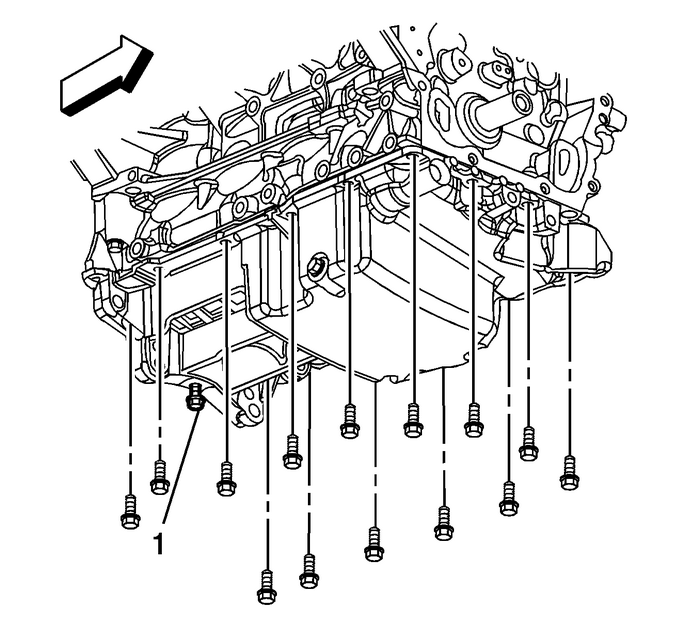 Remove the lower 2 power brake booster pumpbolts-(1).Reposition the pump away from the oil pan. 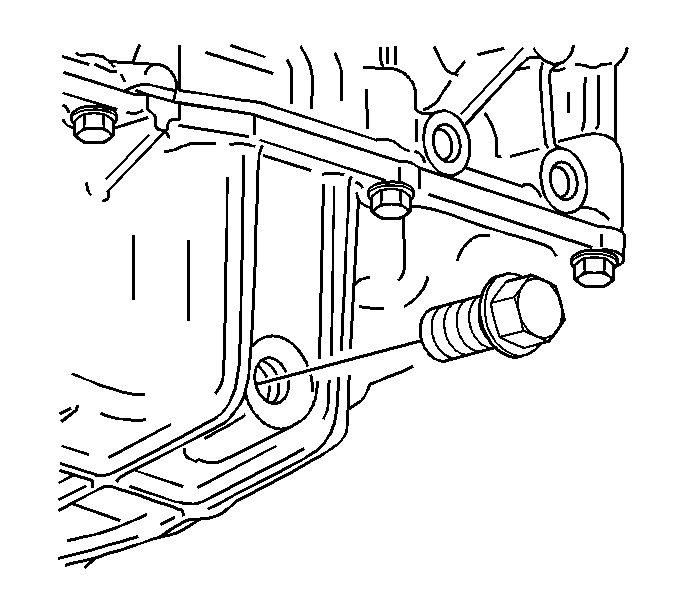 Place a suitable drain pan under the oil pan drainplug.Remove the oil pan drain plug.Drain the engine oil.Reinstall the oil pan drain plug until snug. 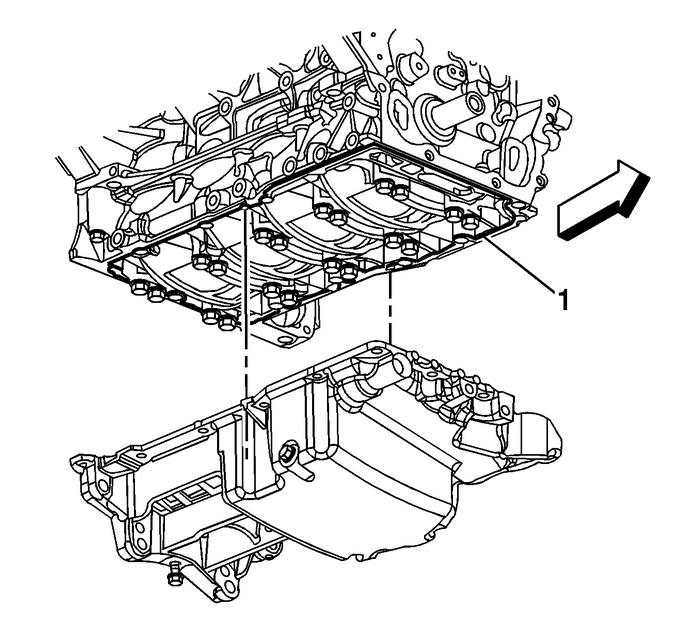 Remove the 4-oil pan to transaxle bolts.Remove the oil pan bolts-(1). 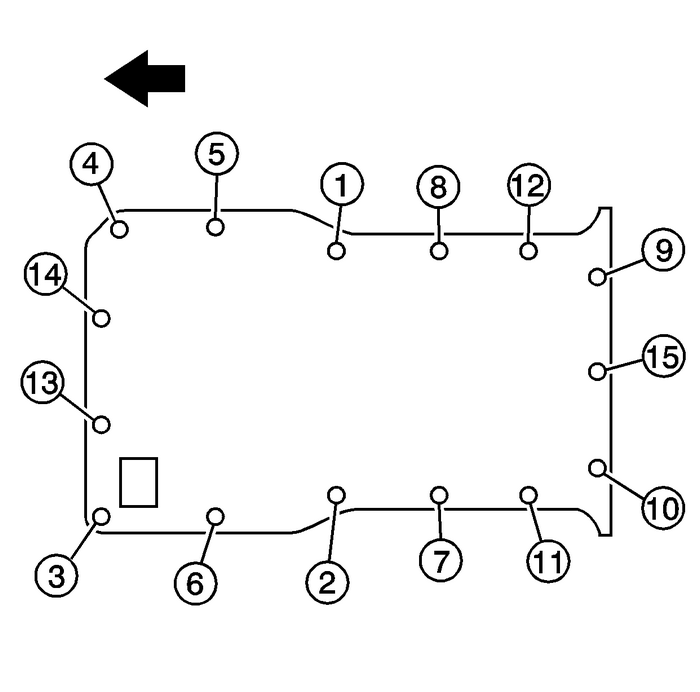 Ensure that the oil pan and the sealing surface on the lowercrankcase are free of all oil and debris.Apply a 2-mm bead of sealant-(1) aroundthe perimeter of the oil pan and the oil suction port opening. DONOT over apply the sealant. More than a 2-mm bead is notrequired. Refer toAdhesives, Fluids, Lubricants, and Sealers.Install the oil pan. Install the oil pan bolts. Install the 4-oil pan to transaxlebolts-(1) and tighten to75-Y(55-lb-ft). Tighten the oil pan bolts in the sequence shown to25-Y(18-lb-ft). 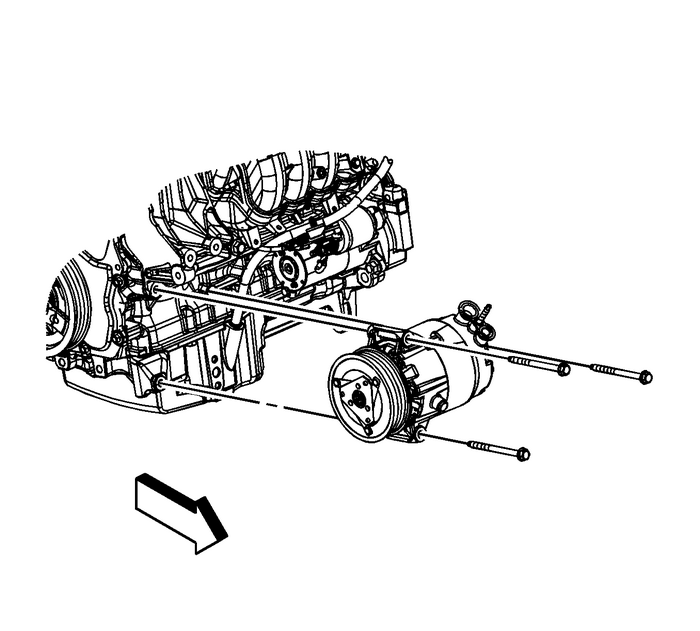 Install the power brake booster pumpbolts-(1).Tighten the power brake booster pump M8 bolt to22-Y(16-lb-ft).Tighten the power brake booster pump M10 bolt to50-Y(37-lb-ft). Install the A/C Compressor bolts tighten bolt to20-Y(15-lb-ft).Lower the vehicle.Install the oil level indicator tube. Refer toOil Level Indicator Tube Replacement.Install the drive belt. Refer toDrive Belt Replacement.Fill the engine oil to the proper level.